The Racing 92 out-half will miss Saturday’s game in Paris due to a head injury. Russell facing Ireland at Murrayfield. SCOTLAND WILL BE without the services of Finn Russell when they meet France in Paris this Saturday. The influential playmaker picked up a head injury after colliding with the knee of Lucas Tauzin during Racing 92′s Top 14 loss to Toulouse on Sunday. 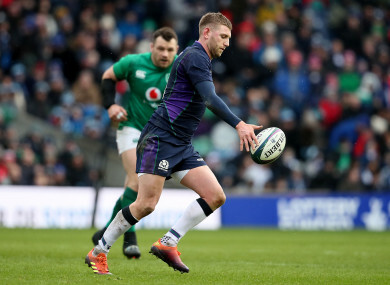 The Scots were hopeful that Russell would recover in time to feature at the Stade de France and he joined up with the squad yesterday. However, a statement released by Scottish Rugby this morning has confirmed that the 26-year-old won’t play any part after failing a concussion test and he has returned to his club for treatment. It represents a major blow for head coach Gregor Townsend with fullback Stuart Hogg also ruled out due to a shoulder problem. Six players have been added — Duncan Weir, Magnus Bradbury, Zander Fagerson, George Turner, Dougie Fife and James Johnstone — as Scotland look to add to their bonus-point win over Italy on the opening weekend of the tournament. Email “Scotland playmaker Russell ruled out of France clash”. Feedback on “Scotland playmaker Russell ruled out of France clash”.